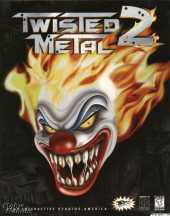 Twisted Metal 2 was the only game in the console series to come on the PC outside Japan and features destructive car combat, playable either as a complete tournament or a single match. It's a demolition derby which permits the usage of ballistic projectiles. Players choose a vehicle and an arena—or a series of arenas in the story mode—to engage in battle with opposing drivers. A variety of weapons are obtainable by pick-ups scattered throughout the stage. The objective of the game is to be the last remaining player. The story follows up from the first game and is set a year later, having a man named Calypso host a vehicular combat tournament called Twisted Metal, which grants its winner a prize: Calypso will grant them one wish. The action takes place in 8 different locations around the world, on differing surfaces, many featuring destructible buildings and landmarks. Combat takes place between a wide array of vehicles ranging from a man strapped between two wheels to an ice cream truck. Each car has its own special move, and the game obeys a logical yet totally unrealistic physics model that allows you to turn on a dime and go flying 100 feet in the air. They have their own strengths and weaknesses, using an eclectic arrangement of weaponry include bombs and missiles, and resulting in its own end sequence, complete with an ironic line in humour. There are also a few multiplayer modes to choose from, including a two-player co-operative mode that allows you and a friend to go against computer-controlled teams.